We are jumping for joy that you have requested the Official Visitors Guide! 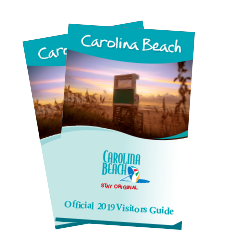 There’s always something original to do in Carolina Beach and the Visitors Guide makes trip planning easy with information on accommodations, attractions, outdoor activities, dining and shopping. Click here to view the digital version of our Visitors Guide where you can print or save as a pdf. If you would like to learn more about special deals, seasonal events and things to do, sign up to receive Carolina Beach eSpecials delivered right to your inbox.